Many people purchase 4 x 4 vehicles for the specific purpose of going off-roading. It can be an exciting and exhilarating experience, however being safe in the dunes can be overlooked. If going off-roading in the sand dunes is your thing, there are a few things that you need to know before heading out. The first thing that you need to do is make sure that it is legal to go off roading at the place that you choose. 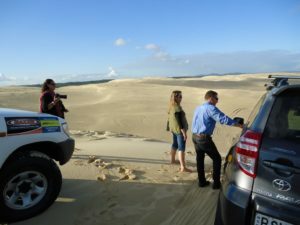 A good resource for finding legal sand dunes in your area is http://www.duneguide.com. This site will give you all of the places where you can tear it up in the sand without getting arrested. Before you head out to go off roading, it is important to bring a friend with you. Whether they are in a vehicle of their own or in your vehicle, you should always have someone there with you just in case something happens. It is a good idea, and in some states it is required by law, to have a flag attached to a tall antenna or a whip. This will make your vehicle more visible to other vehicles that may be off roading at the same time as you. When you are out there in the sand and driving fast with the sand flying around you, it can be difficult to see. Because certain sand dunes are so large, it is a good idea to bring a supply of water along with you. This is especially important if something happens to your vehicle and you need to wait for help to come. Your tires are very important when it comes to going off roading in the sand. For starters, the size of your tires are important. The larger your tires are, the better suited they are for driving around in the sand. Before you go out in the sand dunes, it is necessary that you deflate between 15 to 20 pounds of pressure from your tires before you get onto the dune. This will give you the traction you need when driving in the sand. Before you let the air out of the tires, you should always follow the manufacturers instructions. When you are done off roading, it is important to pump the tires back up before you return to the paved street. It is important to check the consistency of the sand before you go off roading. If you are riding in softer sand, you will need to put your vehicle into its high range four wheel drive. If the sand is harder or wetter, the low range four wheel drive will work fine. When you are out in the sand, it is important to keep your vehicle moving. Getting a good deal of momentum will allow your vehicle to get through the sand. If you need increased tire traction, turn your wheel quickly from the left to the right. If you are loosing traction, be sure not to allow your wheels to spin. The more your wheels spin, the deeper you will get stuck in the sand. If you find that you are stuck in the sand, there are a couple ways that you can try to get out on your own before you call for help. You can first try wetting the sand around your tires. This should give you a bit more traction to get out. If do not have any water, or you have tried water and it does not work, you can use your vehicle’s floor mats. Place a mat in front of each tire and try to pull up slowly. In most cases, this will be effective in getting you out of the hole that you dug yourself into. Off roading in the sand dunes can be a great way to spend an afternoon. It is important however, to do so safely and properly.